A shameful drama on Sunday as an area Governor and a Member of Parliament in Kenya engaged in a fight in front of the Orange Democratic Movement Party leader Raila Odinga and a multitude of people who came for a rally. ODM is one of the biggest political parties in Kenya. 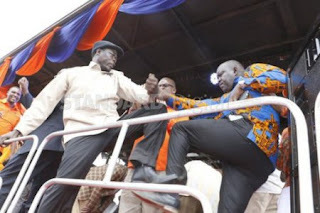 “The issues became heated up when Homa Bay Governor Cyprian Awiti and Kasipul-Kabondo MP Oyugi Magwanga’s supporters began to force their way into a reserved space at the local stadium”, Standardmedia.co.ke reports. Awiti’s supporters shouted that he must be re-elected while those of Magwanga, who has already declared interest in the position, said the Governor must go home. 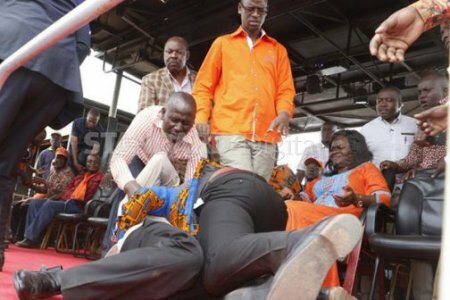 While the supporters were chanting slogans, an argument ensued between Awiti and the legislator and escalated into kicks and blows. Supporters of the fighting leaders hurled stones at them forcing Kisumu Governor Jack Ranguma and Homa Bay Woman Representative Gladys Wanga to run for safety.